Andy Woolford brought his son Collin, a college athlete/angler whose strength we’d come to appreciate shortly on the portage. Joe Merrill brought his godson Tom Merritt back for Tom’s 3’d trip with me. Joe and I had fished the King Salmon, the Upper Nushagak, a creek in the Togiak watershed, and once on an unnamed tundra river to the west. This was the week Olly Merrill, my guide (Joe Merrill’s son), and I would take off from our retail-guiding calendar for a holiday with Olly’s family. 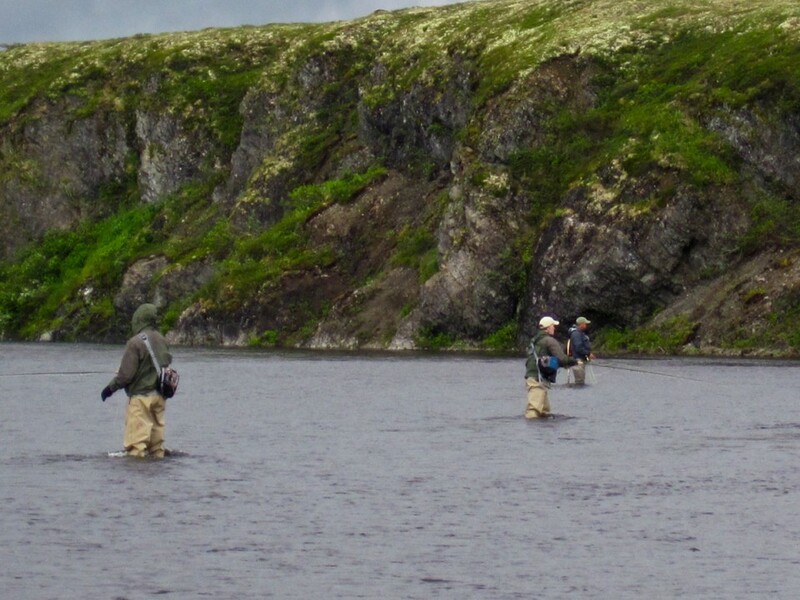 When asked about my favorite week for a fly fishing trip in the Bristol Bay region a very good case can be made for the last few days of July and the first week of August. It combines the “summer like” weather of July with the arrival of the fall Coho salmon. True the Char and Coho fishing will get better in August but the Chum will be gone later as will the Kings. Fathers and sons on a wilderness trip into the unknown! That activity is surely embedded deep in our genetic code. It is at least partly about passing along the knowledge of the father, and blending it with the strengths of the son. In this case we embarked on a fork of a river that we’d call Olly’s fork, after Oliver Merrill, because Olly pioneered the floatplane and portage logistics that allow us to get access into this water. His father Joe had been looking forward to this trip with Olly for several years. The portage went smoothly. It required inflating the rafts and dragging them across the tundra, up a small hill, along a gravely ridge and then lowering them down a bluff. We think about portages with young fit groups as a team enterprise like dog mushing with a “lead dog”, in this case Olly setting the pace on a line attached to the bow and behind the lead dog are two “team dogs” with lines to either side of the raft. An empty 14-foot raft can be dragged across dry tundra nicely with a team of three. A group of five makes such an endeavor nearly effortless. We fished our way from the put in spot at the bluff to camp catching and releasing Arctic Grayling and Dolly Varden Char. From the log of the second day August 3, 2012. “A notably cold and heavy marine layer. The air is 45 degrees and the water is 48 degrees”. In three other journal references on August 3’d I referred to the day as a cold front, a cold parcel of air, and a cold packet of air! In any case we stopped mid day and dug into our dry bags and put on more layers. It was cold. A big lunch of smoked salmon, pilot bread, and crème cheese, and cliff bars fueled the metabolic furnaces. The Char fishing irrespective of the cold of air was excellent. The chum spawn had been in full cycle for two weeks and the Sockeye were starting to spawn. Char wanted eggs above all else so streamers were a distant second choice. 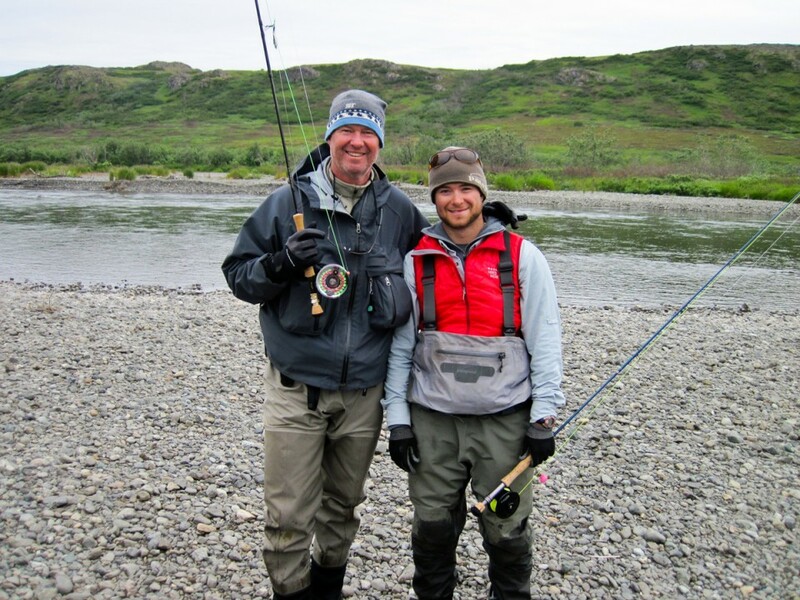 I spent the day fishing with father and son Andy and Collin who’ve come to Alaska eager for the challenge posed by the larger Char and Rainbow than what they’ve experienced at home. Over the course of the week they’d have so many thousands of casts to work out their presentation and fish fighting tactics that they’d end up completely different anglers than they arrived. But on this day the skills and tactics that they’d brought from home took 24 Char including some lovely large males with the deep orange belly colors developing pre-spawn. It is not an exaggeration to say that some Char were taken that were larger than Salmon. The trend for 2012 was becoming clear that the returning Sea Run Dolly Varden Char had had a great period foraging at sea and feeding in the estuary. Across western Bristol Bay the year 2012 was magnificent for Char. 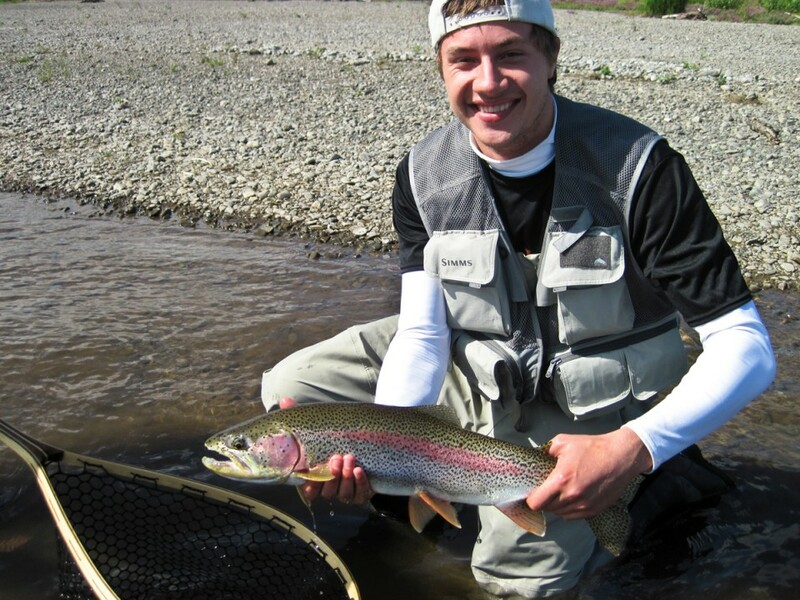 Tommy Merritt released a very large Rainbow on day two with a wide dark crimson stripe. 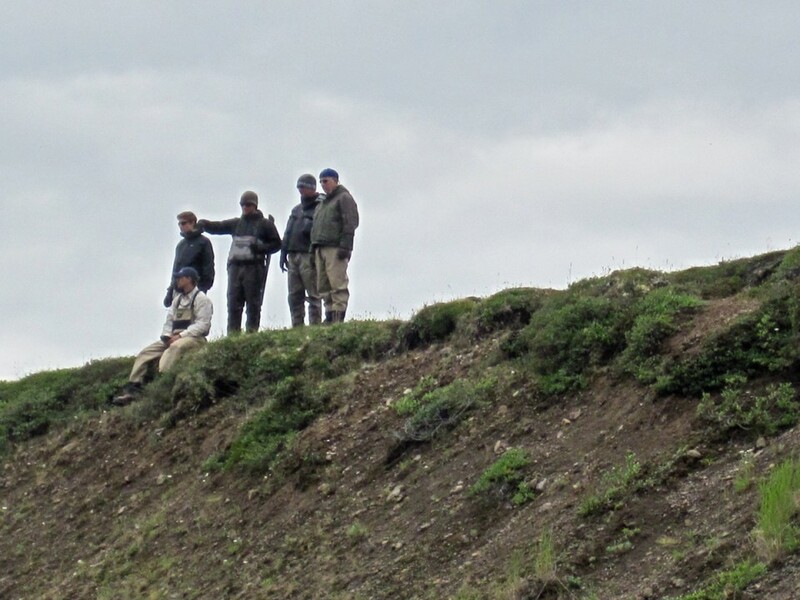 As we travelled we saw an adult Brown Bear in the prime of life grazing on a hill side above the river on the right bank then saw a smaller, younger, 3 or 4 year old bear cross the river above camp while we ate dinner. 2 more bears were seen that night. As usual the bears were singularly focused on their own feeding and not on our activities. We made our third camp on August 4 in a braided section. The cold fog of the prior day had lifted and the air temperature came up above 50 degrees by mid morning. Tommy Merritt took 3 large Rainbows one of which my notes called a “monster” and he seems to have inherited his father John Merritt’s special gift for hooking large fish. Joe took a 20-inch Lake Trout mid morning on a bead. The Laker was in good shape and had been feeding on salmon spawn, twenty miles from any lake. In hindsight the variety of fish taken that day was interesting. Lake Trout, King Salmon, Pink Salmon, Char, Grayling, Chum, and Rainbow. The log recorded some birdlife: “8 Ptarmigan flew across river from left to right making a great cackling-racket”, the young birds of the year had hiked up the bluff to the top before launching themselves out into space and making the big flight crossing to the far bank. Later “a pair of Sand Hill Cranes came right overhead” as we drifted, very low just above the short willow tree tops, and they were vocalizing, a sound I call “chortling,” a wild wavy voice, their wings undulating, their heads so red colored it was startling and contrasted with their white necks. The cranes evoke a similar set of feelings that I experience for Bison and Prong Horn Antelope on the Great Plains and Musk Ox of the Arctic, venerable animals retracing ancient patterns. 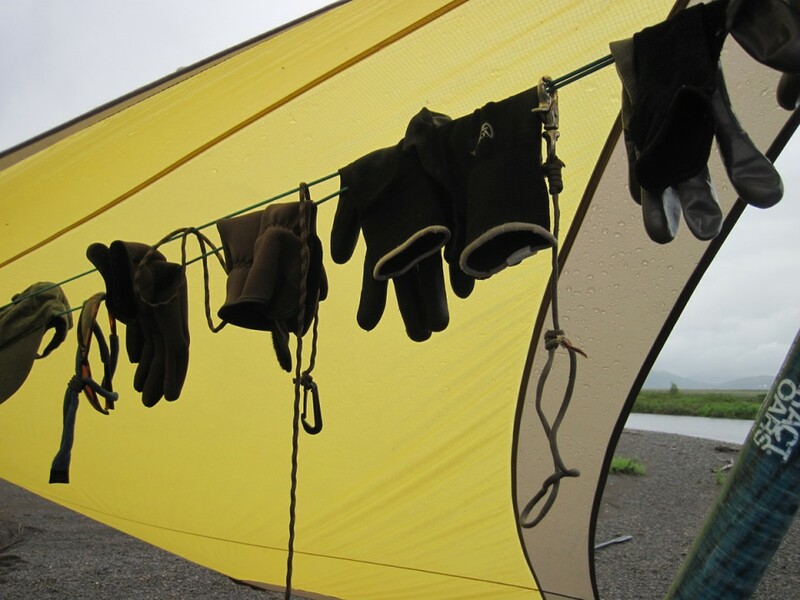 From the log of August 6, 2012: “Our sixth and final camp before take out. Everyone caught Coho / Silvers today. Not easy fish, but good big bold fish. The largest went to Andy who took it in a long straight channel below a large island that split the river. In a different pool Joe Merrill took a very large Coho and then Tommy hooked up along side him”. 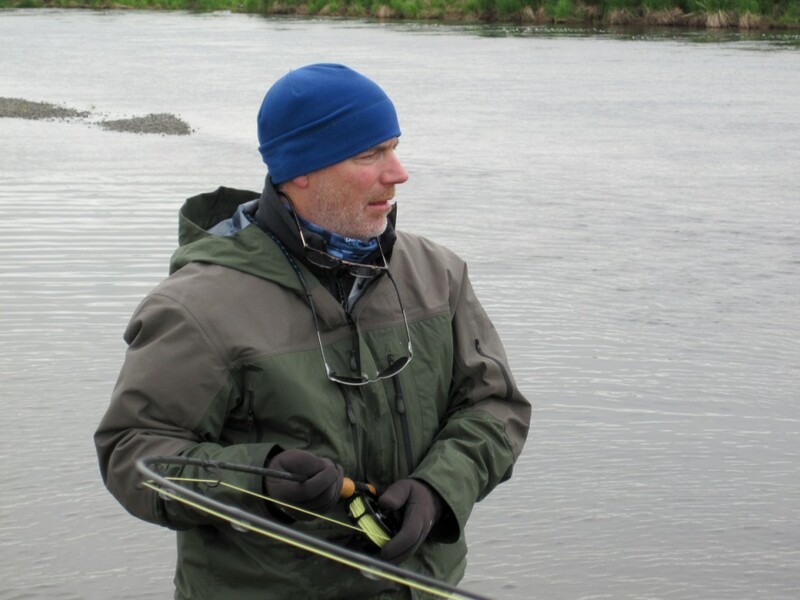 Andy Woolford coming from a New England trout background having cast the big heavy streamer flies for six consecutive days was a markedly different angler than when he’d arrived. His son Collin too. 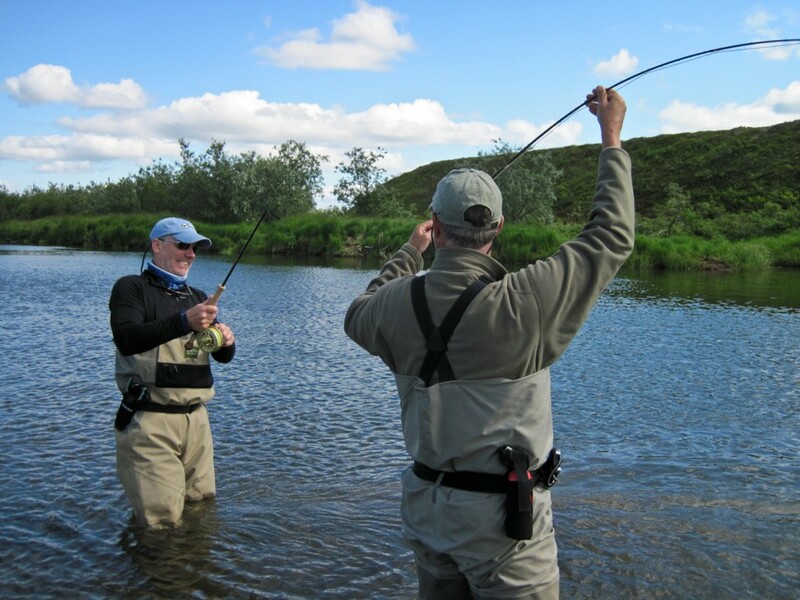 They could present the streamer deep and slowly and effectively fish the pools and channels and they’d learned to dead drift beads among the salmon spawn. Collin put down his rod in the afternoon and took up the challenge of rowing the raft that day. He had a nice oar stroke and I can visualize him on the oars on wild rivers in the future. With young men like Collin and Tommy Merritt and Olly, their lives are changing so fast from year to year it’s hard to know where they’ll be in 2 years or five, much less ten. 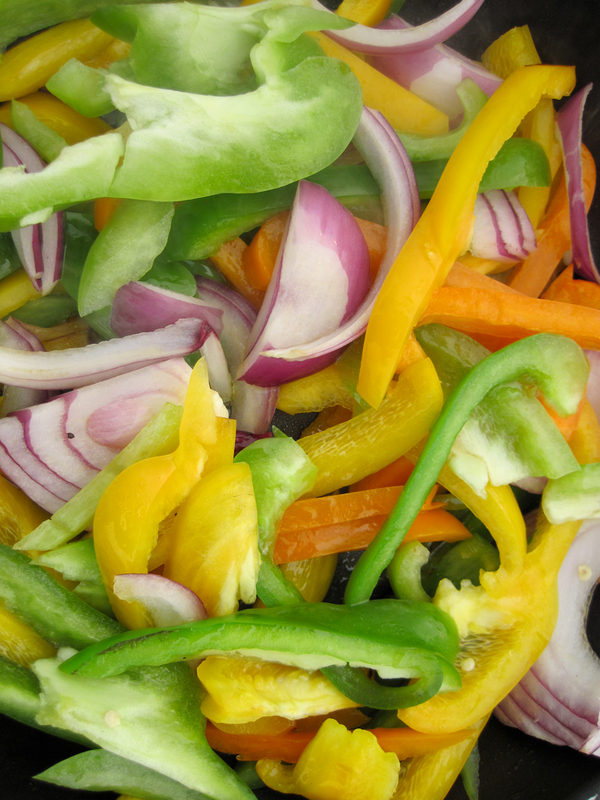 For the fathers, our courses are more predictable. We’ll see each other, or email, and ask about the young men, where are they, what are they doing? Are they going to be home for Christmas? Have they found an internship or work? With a little luck we’ll get a few days on a river with them from time to time. We do know that as years go by it will become increasingly difficult to schedule time together with them for a big trip like this. But whichever direction their lives lead we’ll always share the memories of the perfect week spent together.